ZAGREB, Croatia — In an outburst of national pride and joy, Croatia rolled out a red carpet and staged a euphoric heroes' welcome for the national team on Monday despite its loss to France in the World Cup final. Hundreds of thousands of people wearing national red-and-white checkered colours and waving Croatian flags poured into the streets in the capital Zagreb to greet the team. Observers described the homecoming event as the biggest ever in Croatia. The joyful, singing crowd crammed the central squares and the route where the players passed in an open bus, greeting fans and signing autographs. Police said more than 250,000 people came out in central Zagreb and many more along the route. The players' bus travelled for hours, often stopping when it was blocked by the crowds. "Thank you Croatia, thank you Zagreb!" captain Luka Modric, who won the Golden Ball after being voted the best player of the World Cup, told the crowd after the team finally arrived at the central square in the evening. Midfielder Ivan Rakitic added, "There are no words to describe how we feel now!" The players lined up to sing the national anthem with the packed square thundering in joy. Right-wing nationalist singer Marko Perkovic Thompson joined in toward the end, singing a couple of songs. Thousands of fans, many coming from other parts of the country, began arriving in the centre in the early morning and emergency medical services said they aided hundreds of fans who collapsed from exhaustion. City authorities brought in water tanks to the city centre. Fans honking car horns, waving and shouting "Bravo! Bravo!" welcomed the bus as it slowly left the airport. The inscription at the front read: "Fiery heart, the pride of Croatia!" in reference to the name "The Fiery" as the team is dubbed at home. As the bus went by, fans followed on bicycles or on foot, waving. Large players' photos were displayed along the way amid a cacophony of noise and cheers. The first Croatia team to reach the World Cup final showed off its silver medals and embraced the atmosphere in Zagreb. Rakitic posted a photo on Instagram with controversial singer Thompson, who climbed the bus at some point, saying: "The king is here! One and only! Go Croatia!" Earlier, Croatian air force jets escorted the plane carrying the team from Russia as it entered the country's air space and flew over Zagreb. "Champions! Champions!" roared the crowds as the players came out of the plane to a red carpet on the tarmac at Zagreb airport. The country of four million people has been gripped in euphoria since its team beat England to reach the World Cup final, where Croatia lost to France 4-2 on Sunday. 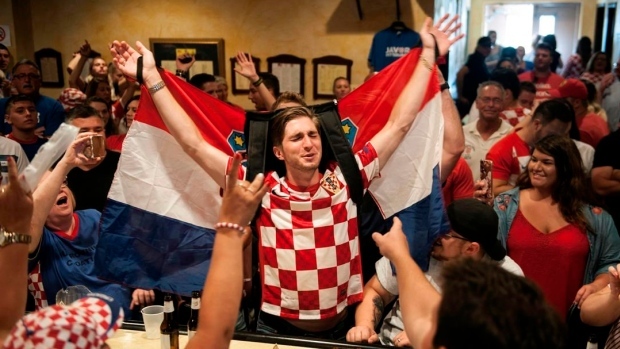 The success has been described as the biggest in Croatia's sporting history, boosting national pride and sense of unity in the country that fought a war to become independent from the former Yugoslavia in the 1990s. Now a member of the European Union, Croatia's economy remains weak and people have been leaving the country looking for a more secure future elsewhere. "I can't even begin to explain what this has meant for Croatian unity," President Kolinda Grabar-Kitarovic told The Associated Press in Moscow on Sunday. "I hope that this ... will boost the country's economic development and bring new jobs and young people back to the country. "I'm so proud not only of our football team, I'm so proud of our nation." Croatia's state railway company halved ticket prices so fans could travel to Zagreb, while city authorities said public transportation would be free on Monday. State TV urged citizens to come out and enjoy "the historic moment" of the players' return, while other media described the players as "our heroes." Associated Press writer Angela Charlton in Moscow contributed to this report.